Daring Bakers time again! Has it been a month already? Wow, the summer is flying by too quickly. I loved Jasmine and Annemarie's challenge choice. I had never heard of a Bakewell Tart let alone tasted one so I was excited to do this something new. I told Jasmine that I was making my tart with my friend Lynn's homemade red currant jam. I stopped by Lynn's house to pick up the delicious jam and to also pick some fresh red currants from her bush in the backyard. I wanted to sugar the fresh currants and use them as a garnish for the tart. Jasmine liked the ideas and wished me luck. Jasmine was right, it only took me a couple of hours to complete the whole tart. This is one of the quickest challenges yet. Enjoy! Thank you Jasmine and Annemarie for a great challenge! 1. Place the chilled dough disc on a lightly floured surface. If it's overly cold, you will need to let it become acclimatised for about 15 minutes before you roll it out. Flour the rolling pin and roll the pastry to 5mm (1/4”) thickness, by rolling in one direction only (start from the centre and roll away from you), and turning the disc a quarter turn after each roll. When the pastry is to the desired size and thickness, transfer it to the tart pan, press in and trim the excess dough. Patch any holes, fissures or tears with trimmed bits. Chill in the freezer for 15 minutes. 2. Preheat oven to 200C/400F. 3. Remove shell from freezer, spread as even a layer as you can of jam onto the pastry base. Top with frangipane, spreading to cover the entire surface of the tart. Smooth the top and pop into the oven for 30 minutes. Five minutes before the tart is done, the top will be poofy and brownish. Remove from oven and strew flaked almonds on top and return to the heat for the last five minutes of baking. 4. The finished tart will have a golden crust and the frangipane will be tanned, poofy and a bit spongy-looking. Remove from the oven and cool on the counter. Serve warm, with crème fraîche, whipped cream or custard sauce if you wish. 5. When you slice into the tart, the almond paste will be firm, but slightly squidgy and the crust should be crisp but not tough. 1. Sift together flour, sugar and salt. Grate butter into the flour mixture, using the large hole-side of a box grater. Using your finger tips only, and working very quickly, rub the fat into the flour until the mixture resembles bread crumbs. Set aside. 2. Lightly beat the egg yolks with the almond extract (if using) and quickly mix into the flour mixture. Keep mixing while dribbling in the water, only adding enough to form a cohesive and slightly sticky dough. 1. Cream butter and sugar together for about a minute or until the mixture is primrose in colour and very fluffy. Scrape down the side of the bowl and add the eggs, one at a time, beating well after each addition. The batter may appear to curdle. In the words of Douglas Adams: Don’t panic. Really. It’ll be fine. After all three are in, pour in the almond extract and mix for about another 30 seconds and scrape down the sides again. With the beaters on, spoon in the ground nuts and the flour. Mix well. The mixture will be soft, keep its slightly curdled look (mostly from the almonds) and retain its pallid yellow colour. I am bringing my plate, lining up the long queue for a piece now. wow, i have never baked with fresh currants before! sounds like quite an undertaking. great photos! Yum I love red currants and that looks fabulous! The currants are like jewels atop your tart. Lovely! A very pretty tart! I love that filling! The redcurrants make your tart look so beautifully dressed. Your sugared currants add a touch of elegance. Great job! avec des groseilles, j'aurai adoré ! Great pics! I loved how you embelish this tart! I love that word fragipane, it sounds like something I'd say if I stubbed my toe. Mouthwatering dessert indeed! It's a perfectly formed tart and I just love the fresh currents addition. Amazing!! Looks like it came out perfect! Oooooh, that currant jam looks totally amazing! Yum...gorgeous tart! Hee! The look on your face at the bigscarymegamart was priceless. Your gorgeous tart was baked well indeed. I love all the photos. Great presentation! Congrats! Delicious and sophisticated! The fresh currants look lovely on top. Wonderful job! I am so jealous that you have a red currant bush handy. Beautiful sugared currants. I LOVE that you ran into Jasmine. That's hilarious! I wish I ran into Daring Bakers at my local grocery store!! I am in love with your tart! The sugared currents just add a little extra pizazz. I love red currants. so far this is my favorite bakewell tart. Beautiful presentation. I have never had red currants, to my knowledge, but they look like they would be really yummy. What a beautiful tart! Lovely photos. Yours look amazing! Love the sugared berries on top. The currants are so beautiful. i wish i could have some of that jam! pretty pictures. Love the thick jam layer & beautiful frangipane! Very pretty! 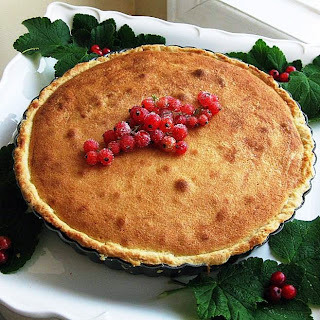 Beautiful tart and your photos are amazing! I love red currants. Beautiful job on your tart!! The currants sound wonderful, as a jam and a garnish! Yum =D. Love the sugared currants! I bet that tart tasted delicious! Oh, your tart looks absolutely wonderful! I've never had current jam before, I will have to try and find some. Looks perfect! Fresh currants are very hard to get around here, so I can only imagine what a special treat this would be. Currents are a great idea for jam, and they're so pretty on top too. Everything you make looks so delicious. Wow, that is so pretty. Red currants, we don't see them too often in Australia. Love your photography. That's just gorgeous Paula...stunning. I remember Jasmine rediscovering you through the Apple Cake I posted off your blog ages ago. What fun these coincidences are.Your Bakewell is so appealing & exciting. I love th ered currants & the jam too. How yum!! I guess I'm too late for a slice, though I'll still stand in queue. Could wait for this forever! Gorgeous, gorgeous tart! I love red currants. My mom grows them, but they moved a couple years ago and her new bushes haven't produced a good crop yet. Maybe this year! Beautiful job on the tart. I wish I would have had the time this month to participate. Sigh....another one of those life gets in the way months. oh my God. That looks SO rich and tempting! It's to DIE for! Well, I can see I didn't put enough of that frangipane on my tart but we did enjoy it. How fabulous that you can run into Jasmine in the grocery store!! And you have a friend like Lynn with homemade red currant jam and fresh ones as well. Scrumptious! Well done, your tart look absolutely gorgeous. Luscious, really luscious and so lucky to have a friend that makes such jam! I'll bet this was so delicious! Jamie's right! this is soooo luscious looking! Great job on your challenge and your tart looks absolutely delicious. Love the pictures and presentation too! love the filling!..great looking tart!..thanks for dropping. That is one delicious looking tart and sounds so tasty! That looks like the perfect thing to bring to an outdoor summer lunch! How pretty. I've never tasted a Bakewell tart but would love to - it looks so pretty and sounds delicious especially with the red currant jam! It's been far too long since I've had currants, and this looks like the perfect application. Beautiful photos too! Where oh where can I get fresh currants? They look so pretty on your beautiful tart. It looks like just the thing for afternoon tea, my favorite little ritual. I will definitely try this. absolutely beautiful! and i bet the currant filling tastes wonderful, too! i've never had currants before. awesome job on the challenge! Gorgeous! I love the current filling and the fresh currants on top of the tart. Great challenge! Those sugared currants are gorgeous! Beautiful - those currants look like little jewels! Very pretty! The frangipane looks perfect, and currants are one of my favourite fruit! They look so tempting! I was also surprised at how quick this recipe was. Looks so delicious! I also waited until the last minute. Next month I will start sooner! Those sugared red currents look like little rubies, and i bet their flavor was great with the frangipane. I love that you got "busted" in the grocery store. Nice job pulling the tart together at the last minute - glad it worked out for you. So pretty! I love the glossy, sugary red currants. I love the sound of this, probably because I'm a total almond fanatic :). Great pictures too. I love red currants. Nice choice for your challenge, your tart looks perfect. Your tart is beautiful and looks delicious, mmmm, love currants! 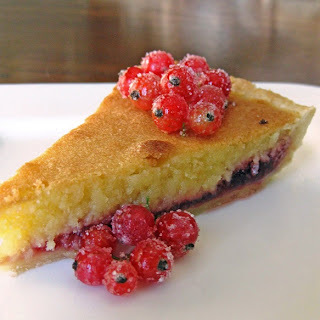 great photos, great flavours, great tart.. Love the sugared currants on top, they look like ruby coloured jewels. Oh, I also love the little sugared berries on top, they are gorgeous! Mmm, sugary currant filling and topping, this tart is a perfect summer twist. I've never seen a red current bush but what beautiful fruit! It was a great challenge, wasn't it! Oh I wish we could get currents like that here in Texas! They look wonderful! we all know the tart is amazing, but I'm particularly loving the currants! Mail me a slice? It looks so good! Tart has browned beautifully and the sugared currants look so good. Your tart looks perfect! I love the fresh currants on top. YUM. Now that is a beautiful tart! Yummy tart. Nice idea with the sugared red currants. Oh man that looks good. Can I use blueberries? 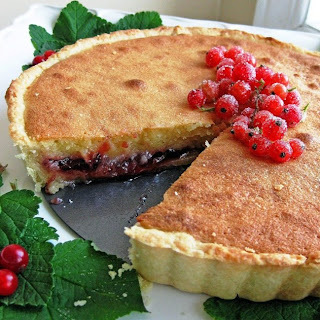 Beautiful tart and I love the sugared currants! Dragon thank you for visiting me!! I loved this challenge too and I had never heard of a Bakewell tart before, it's fantastic to discover new recipes!! 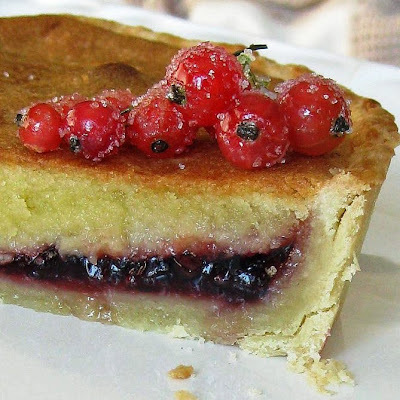 Your Bakewell Tart looks fantastic and delicious with the red currants! 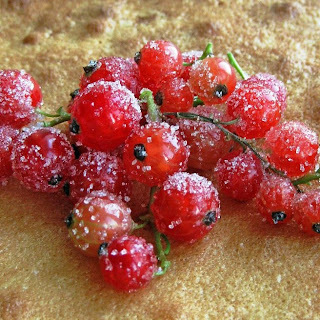 !The sugared currants looks very nice, and the photos are very appetizing. Ha, you live so close to me! I'm in London. I love when I meet DB'ers in Ontario. Thanks for the nice comments. I will definitely be checking your blog form now on. It's great. Your tart looks very yummy. I love that you used red currants! That sounds delicious and your tarts looks so beautiful with the sugared currants on top. Well done!